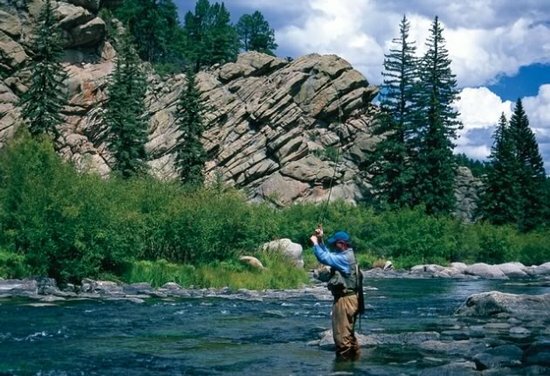 Over the years, when most fly fishers went to the South Platte, they headed for the Dream Stream below Spinney Reservoir or boulder-strewn Cheesman Canyon. Elevenmile Reservoir was completed in 1932, but it wasn’t until the past decade that the river below Elevenmile Dam blossomed into a premier Western tailwater. Regulation changes, recent stream improvements—such as placing natural in-stream structure to enhance habitat—more stable flows, and the absence of whirling disease have all helped to create a great fishery. The habitat improvements and catch-and-release,artificials-only regulations enacted in 2000 have progressively increased fish counts, and, according to 2005 Colorado Division of Wildlife (CDOW) electro-shocking data, there are now more than 3,500 trout per mile in the approximately 2 miles of catch-and-release water from the dam to Springer Gulch Bridge. According to Jeff Spohn, aquatic biologist for the upper South Platte River Basin, “These are the highest fish numbers we have ever observed in this section of the South Platte River.” Below Springer Gulch Bridge, there is a daily limit of four fish, but most fly fishers practice catch-and-release, and Spohn says that many of the wild rainbows are swimming downstream, helping with the overall fish populations on the lower river. The fishery is loaded with trout that fatten quickly on prolific tiny midges and a wide range of miniscule mayflies. Between the 135-foot-high dam and the town of Lake George, approximately 10 miles of prime trout stream carves its way through a majestic, granite-lined canyon sprinkled with moss-covered boulders and fallen ponderosa pines. The stream has deep holes, riffles, runs, mid-channel shelves, and superb pocketwater, providing a wide array of trout habitat. The clear currents and tree-lined streambanks add to the canyon’s scenic beauty. Anglers can fish flats for rising fish or high-stick nymphs in pocketwater to pods of fish feeding in the swirling currents. Elevenmile Canyon is known for its early-season fishing, especially for dry-fly enthusiasts. By February midges hatch for several hours, offering some of the best dry-fly fishing on the entire South Platte. Long leaders and 7X tippets are critical to fool the selective trout. Parachute Adams (#26), Cannon’s Snow Shoe Suspender Midge (#24), Matt’s Midge (#24), or a Griffith’s Gnat (#24-26) are all good choices. Between hatches, sight-nymph with tiny midges (#24-26) to fish holding in the mid-channel shelves that funnel into the deeper runs and pools. The fish stack up in the slow, deep pools, conserving energy and weathering the icy flows. The first mile of river below the dam rarely freezes, even in the dead of winter, but the lower river always freezes. The canyon is weather-locked and receives very little sunshine. The fish are spooky in the low flows, which average between 30 and 60 cfs. As the water starts to warm in mid-April, Blue-winged Olives (BWOs) begin to hatch, though they can hatch as early as mid-March if the weather is unseasonably warm. I nymph before the hatch with a #20 Sparkle Wing RS2 or #20 Mercury Flashback Pheasant Tail. By mid-afternoon, I can cast to rising trout in the slower stretches and shaded areas with a #20 Hi-Vis Baetis. Baetis hatches can be heavy if the skies are overcast, and more fish key on the duns. Even if Baetis are hatching, midges are still important, especially when nymphing in the early morning and late evenings. Flows average between 80 and 120 cfs, which is perfect this time of year. With increased flow, the trout are not as spooky as they are in the lower wintertime flows. Baetis hatches awaken the trout, which move from the slow, deep pools into the riffles looking for mayfly nymphs. In April, it’s common to see large rainbows spawning between Springer Gulch Bridge and the dam. Be careful not to step on any redds while wading and avoid fishing to spawning trout on redds. A Nuclear Egg with a #20 Mercury Flashback Pheasant Tail or a #20 Sparkle Wing RS2 dropper is effective in the riffles below redds and in the faster slots and seams. Streamers will also fool a few fish. By the beginning of May, Yellow Sally stoneflies start to hatch. Nymph the riffles with a #16 Oliver Edwards Yellow Sally Stonefly Nymph or a #14-16 Pheasant Tail, and fish yellow Stimulators toward the banks and the heads of the gravel bars and runs. You can drop a Pheasant Tail off the back of a Stimulator and cover all your bases. Much like during a caddis hatch, it’s nearly impossible to find fish feeding with any type of rhythm during this hatch, so cover the water methodically with a yellow Stimulator or similar pattern. Splashy riseforms are signs that trout are eating fluttering insects, and the strikes to your fly are also often aggressive and splashy. As water temperatures climb to the low 50s, caddisflies begin to hatch in the late afternoon through evening, with the best fishing between 6 P.M. and dark. You can catch fish on the surface with a tan Elk-hair Caddis or Goddard Caddis, but drop a smaller bead-head nymph such as a #20 Flashback Pheasant Tail or Barr Emerger off the bend of the dry-fly hook for the best results. Before the hatch, a caddis nymph such as a #18 Buckskin, #16 LaFontaine’s Sparkle Pupa, #18 Mercury Caddis, and #16 Beadhead Breadcrust is effective. In addition to mayfly and caddis hatches, high flows in early spring (before the water drops to between 80 and 120 cfs) dislodge larger food organisms, and the trout are gluttons for scuds and worms. In fact, fishing seems easy for a while. I call this the “stupid period,” because the trout in the riffles will eat anything that resembles a worm or scud. This frenzy is short-lived, as the trout quickly become wise to worm imitations. I then switch to a smaller micro worm, which they seem less suspicious of. Pale Morning Duns (PMDs) typically begin hatching by mid-June. At this time the flows are between 150 and 250 cfs, which is usually conducive to good surface activity. Anything above 250 cfs creates less-than-ideal dry-fly conditions. The nymphs and emergers are still important to the trout, but there seem to be fewer visible duns, and fewer fish feeding on adult PMDs. Three great choices for this mayfly hatch are a PMD Mathews’s Sparkle Dun, PMD Cannon’s Snow Shoe Dun, or a Stalcup’s CDC Pale Morning Dun (all #16). The hatch begins around 10 A.M. and typically lasts until noon. Before and after the hatch, fish a #18 Mercury Flashback Pheasant Tail or a #18 PMD Barr Emerger in transition areas such as at the top ends of the runs and mid-channel gravel bars, where trout feed voraciously on PMD nymphs. Water temperatures begin to rise quickly by June (mid 50s and lower 60s) because of the dam’s top-release design. (The warmest water is on the surface of Elevenmile Reservoir.) Many anglers believe that these warmer water temperatures help create the superb caddis fishing in Elevenmile Canyon. When the water is drawn from the bottom, the temperatures are colder and caddis hatches less prevalent. If water temperatures approach the high 60s, fishing becomes tough and unproductive. In low-water years or during a severe drought, temperatures may rise into the low 70s. CDOW and Trout Unlimited encourage anglers to voluntary refrain from fishing when this occurs, because high water temperatures stress the fish, and hooking and landing them only adds to the problem. Tricos begin to hatch in mid-July (sometimes as early as mid-June), offering unbelievable dry-fly fishing through mid-September and sporadic opportunities to catch fish on the surface through October, and occasionally into November. This is Elevenmile’s premier hatch. Local guides’ favorite patterns are a #24-26 Stalcup’s CDC Black Trico Comparadun or a #24-26 Z-Lon Trico Dun. Both these flies are easy to see—a plus when Trico fishing—and fool fish regularly. The duns begin hatching shortly after 7 A.M. The females have an olive body and black thorax and the males are solid black. In addition, the females are generally a little larger than the males. Some anglers feel compelled to carry both male and female Tricos, but I have never observed a trout that wouldn’t take a plain black spinner presented on the dead-drift. A #24 Stalcup’s CDC Comparadun works well when you’re trying to imitate the duns. Later in the season, heavy moss and grass in some of the shallow areas make nymphing impossible, but these areas are still prime locations to catch big trout feeding on dry flies. August means “hopper time,” and big browns can be fooled in the lower sections of Elevenmile Canyon with a #10 Dave’s Hopper either fished alone or with a #18-20 red Mercury Pheasant Tail, red Copper John, or Mercury Baetis dropper. Autumn (September-October).Some of the best fishing of the year occurs in autumn. Flows range between 50 and 100 cfs. Anything below 100 cfs makes for challenging dry-fly fishing. Stealth is important during these lower flows, and generally a long upstream cast is the most effective tactic. Use a 9- to 12-foot leader with 7X tippet. By the third week of September, male Trico duns begin to hatch in the morning rather than the night before. The males hatch shortly after 9 A.M., followed by the females around 10:30. The duns float on the water’s surface longer than they do in the summer because their wings take longer to dry in the cool air temperatures, creating great dry-fly fishing with Trico dun patterns. The spinner fall occurs around noon. In addition to Tricos, Blue-winged Olives and midges are also important hatches. Mornings start to get cool, and the feeding window begins to shrink. Fishing is usually best after 10 A.M. Until midday, nymph with tiny Pheasant Tails, RS2s, and Barr Emergers. Blue-winged Olives typically hatch every afternoon, especially if skies are overcast. In October, Elevenmile Canyon’s trees are ablaze with fall color and the crowds begin to diminish, making this one of my favorite times to fish. Brown trout spawn toward the latter part of October, and once again egg patterns fished below redds are effective. In November, the fish begin to move back into their traditional winter lies, preparing for leaner times, and their metabolism slows down. Anglers can expect sporadic Blue-winged Olive hatches during the first half of November, but after that, midges make up the bulk of the trout’s diet. December and January are the toughest months to consistently hook trout, and the greatest challenge is locating feeding fish. For every dozen trout you spot, only a handful may be actually feeding. Water temperatures are the coldest of the year, and the fish are lethargic and unwilling to move more than an inch or two to feed. Fish suspended in the currents are usually feeding. Ignore the nonfeeding trout, which are typically hugging the bottom and show no apparent signs of movement. Once I spot a suspended fish, I drift a small (#22-24) midge pattern such as a Mercury Midge, Top Secret Midge, Black Beauty, or Mercury Blood Midge as close to it as possible. Getting ThereTo get to Elevenmile Canyon take US 24—the major road between Colorado Springs and South Park—from Fairplay or Colorado Springs. When you arrive at the small community of Lake George, turn south on CR 96 and follow the signs to Elevenmile Canyon. FR 245, a gravel road that can be rough at times, closely follows the river to the dam. There are five campgrounds (Blue Mountain, Riverside, Springer Gulch, Cove, and Spillway) near the river, as well as four roadside picnic areas that provide beautiful settings for a streamside lunch. The campgrounds and picnic areas make Elevenmile a convenient place for day or overnight trips. Most of Elevenmile is public water with the exception of Camp Alexander, a Boy Scout facility approximately a mile into the lower canyon. Please respect allno-trespassing signs. Elevenmile Canyon is a fly-fishing paradise offering a wide array of year-round fishing opportunities. Easy and convenient access, great hatches, and lots of eager fish combined with scenic beauty make this the perfect choice for your next fly-fishing adventure.